The movie was stunning and this was an exceptionally fine adaptation. IIRC my ex-wife even liked this. Topps had some good stuff going on, esp the Kirby. It's not a bad film, and I love it's style but Dracula is one of my favorite novels and one of my favorite films are there are atleast three other versions I like better than Coppala's. Murnau, Browning, and Fisher? Or maybe Herzog? French comics had a real new wave in the early 90ies with L'Association, as if Fantagraphics had been for France what Image was for the US back then. 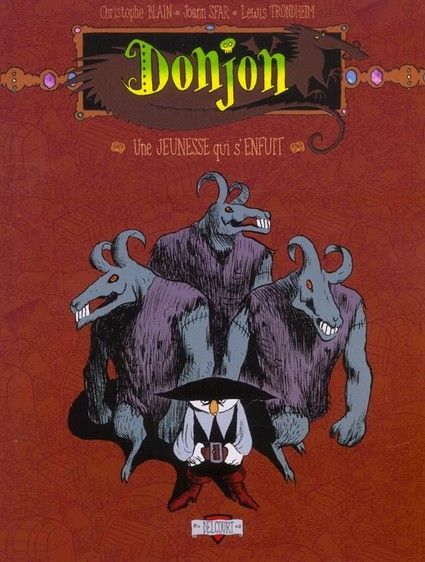 Most of those athors are still famous, probably even more, some have crossed over to movie making, but the great thing is that in the second half of those 90ies, most of those guys went to do some work for Delcourt, like the french DC. 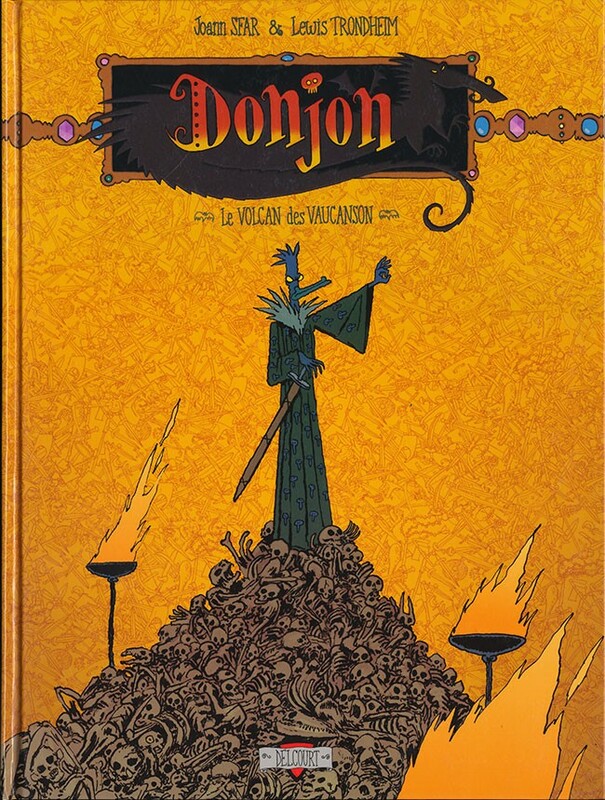 Donjon is one of those works, created by Sfar and Trondheim, three interconnected series told at three different times. 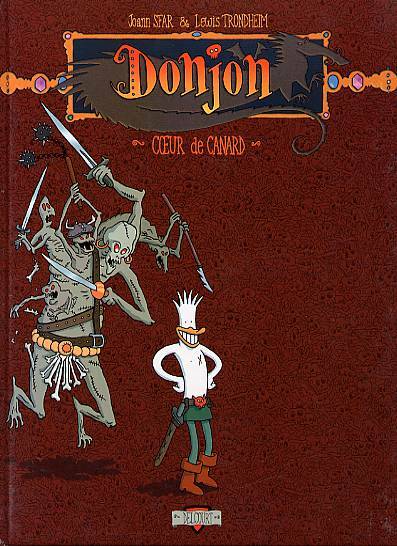 The main one is Zenith, illustrated by Trondheim, the one in the past is Potron Minet, illustrated by the amzing Blain, and Crepuscule is the futire, where the series would end, illustrated by Sfar and later by the Keraskoët duo. If it seem at first to use the heroic fantasy genre as Dave Sim did with Cerebus, it rapidly turns into something equaly ambitious but with very different objectives and means. Sfar and Trondheim are obviously making fun of their D&D days, but not in a mainstream way : they go deep in geekiness, but play it straight, even with the jokes. Most of the humor comes from the very crude language used in real life ther transposed in a world we don't associate with vulgar street talk. Also, the characters are sexualized, and behave badly, which in a way reminds me of the work of Dave Cooper or even Jim Woodring, when funny animals become dark and somewhat creepy. But all in all, it tells a great story of adventures, dinasties, curses, and ends up in quasi Sci-Fi concepts. There are other volumes to the three series, but those came a little later and have a different feel. There's also two aditional series to those main three, "Monster" which has many volumes, each by a diferent artist, focussing on a character of the main series, but often crucial to the main storyline. Then there's "Parade", which is more just about stupid fun, more childish, illustrated by Larcenet. I nominated this since I often revisit it and constantly find new cool details that previously escaped me. And if the drawing style might appear childish, it is actually rather subtle, and it really grows on you, the story being so strong doesn't hurt either. I know quite a few volumes have been published in the US, but I don't know how far the publication went. But really, in this series, as in all great role playing game sessions, the end isn't really the goal, it's all about the journey, and you never really end with a cliffhanger, especially not in the volumes I nominated. Thanks for that AGS. I'd never heard of it. Maybe it's available on Comixology. I don't see it there, but they have a series by Trondheim and Larcenet which is quite good, "The Cosmonauts of the future". Herzog, Browning, Murnau, John Badham and I think Fisher and Coppala would be tied. So I guess four other versions are superior in my mind, but all listed are good. How about the Dan Curtis one with Jack Palance? I thin it's close in spirit to the Coppola one. It stars Frank Langella as Dracula, and if you do go looking get the director's cut with the muted color pallet. Universal felt they needed big bright colors for their first color Dracula and it totally detracted from the mood but with the darker color filter and softer light effects it looks almost like a black and white film which is neat. Dark Shadows was probably superior, but his TV adaptation of Dracula was pretty decent. A girl named Jenny finds herself transported to a strange world, where she befriends its great superhero, a kid named Zot! Her brother is transformed into a monkey. There are some wild villains and some plot about a key. The series returns after a hiatus, now in black & white, and now realizing that it's really Jenny's story more than Zot's. Zot will still have moments. His battle with 9-Jack-9 is one of the greatest superhero/villain battles ever. We learn secrets that have troubled me deeply ever since first reading, and a line by Uncle Max about 9-Jack-9 haunts me more than any sentence I've ever read in a comic. Seems more relevant now than ever. The best issue of the series in my mind is entitled "Autumn" and focuses on Jenny's mom. It's about the struggle between dreams and practicality, about what we lost along away. And the power of senses to transport us back to a different time now gone. Still one of the best works of comics I've ever encountered. I have 2 of the issues of that Dracula adaptation, I need to pick up the rest so I can read it. So again read most of what was listed on this day. You definitely need to pick those issues up the Topps Dracula is great.